Many state and local jurisdictions offer cash incentives and tax credits for companies which expand employment, increase investment, meet specific targeted industry requirements or are located in an incentive zone. The requirements for these incentives as well as taxing rules vary by jurisdiction. 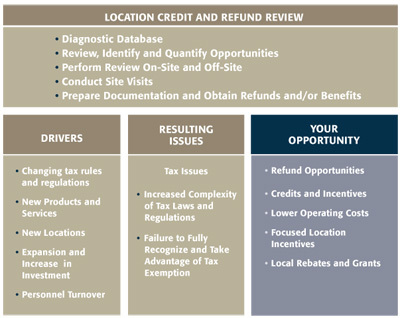 Based upon the type of activity at each location, a company may be entitled to tax refunds, training grants, property tax relief, sales tax refunds and/or exemptions and tax credits. 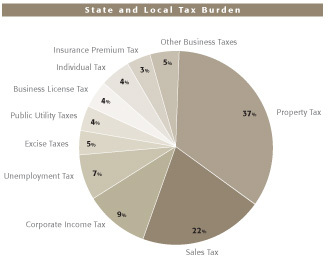 State and local taxes make up a significant part of a corporate tax burdens. With frequent changes in the code and over 5,000 different state and local taxing jurisdictions, it is difficult for companies to identify many potential tax savings and refunds. Consequently, these opportunities are often lost. Our staff includes Former Big 4 Professionals, Former State and Local Tax Auditors and Tax Attorneys. Our technology enhanced methodology allows us to pinpoint opportunities and quickly quantify benefits and refunds. Our team is experienced in the multifaceted taxing jurisdictions allowing us to recover taxes as well as negotiate state and local incentives.